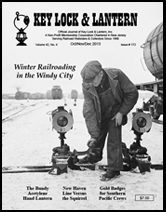 Gaithersburg Railroadiana Show, Brookline Railroadiana Auction Report, Soulis Dining Car China Auction Report, Book Review of the Railroadiana II Price Guide, Reproduction Wabash China Supports Locomotive Project, Want Ads & Railroadiana Event Calendar. 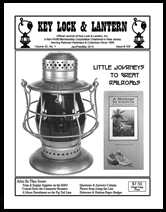 Amtrak Exhibit Train Celebrates Passenger Railroad's 40th Anniversary, JW Auctions Lantern Auction Report, Railroad Memories Mail-Bid Auction Report, Railroadiana E-mail List, Want Ads & Railroadiana Event Calendar. 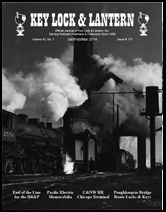 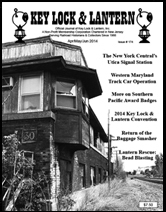 Train Show Supports Restoration of Buffalo Central Terminal, Virginian Collectors Bid High at Booker Francis Auction, Railroad Memories Mail-Bid Auction Results, Key Lock & Lantern Advertising Guide Issued, Want Ads & Railroadiana Event Calendar. 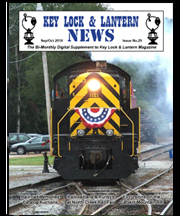 Key Lock & Lantern Convention, Museums Celebrate Roanoke's Railroad Heritage, Amtrak Announces Exhibit Train Schedule, New York Central Historical Society Convention, Want Ads & Railroadiana Event Calendar. 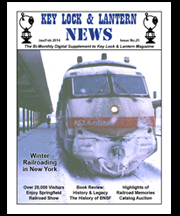 Albany to Host Railroad Historical Conventions, The Mohawk & Hudson: Pioneer Railroad Line, Amtrak Plans 40th Anniversary Events, Key Lock & Lantern Membership, Want Ads & Railroadiana Event Calendar. 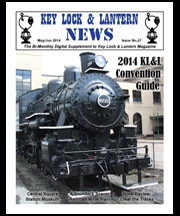 Key Lock & Lantern Convention Dates Announced, Poughkeepsie Bridge: Walkway Over the Hudson, Springfield Railroad Hobby Show Draws Large Crowd, KL&L Website Expands, Want Ads & Railroadiana Event Calendar.